This week was a trip that was 3 years in the making. Having a representative from all four guides families was something that took a lot of planning to make it work. An unfortunate mishap early in the season left Mark with a broken leg and so he and Nancy would stay behind while the rest of the family ventured out. Our participants were eager to get on the river and the energy level was high. Floating the Kanektok was going to be a grand journey for this gang. found other forms of entertainment. Jeff, Nora, Brian, Carl were welcomed into the Romo store where Aubrey and her mother served them coffee and cookies to get out of the rain plus a Garden tour of the Romo Green house. We waited patiently, knowing that the weather was out of our hands and obviously we would always rather be safe than sorry when if comes to bush flying. The hours passed and the weather showed few signs of improvement and we realized that we might not be getting out on this day. Some other anglers were booked in the Kingfisher House but Rick and Denise Grant graciously offered us lodging in their house up at lake Aleknagik. Our guide Aubrey Romo’s family invited us for a big dinner with fresh vegetables from their incredible greenhouse and garden. 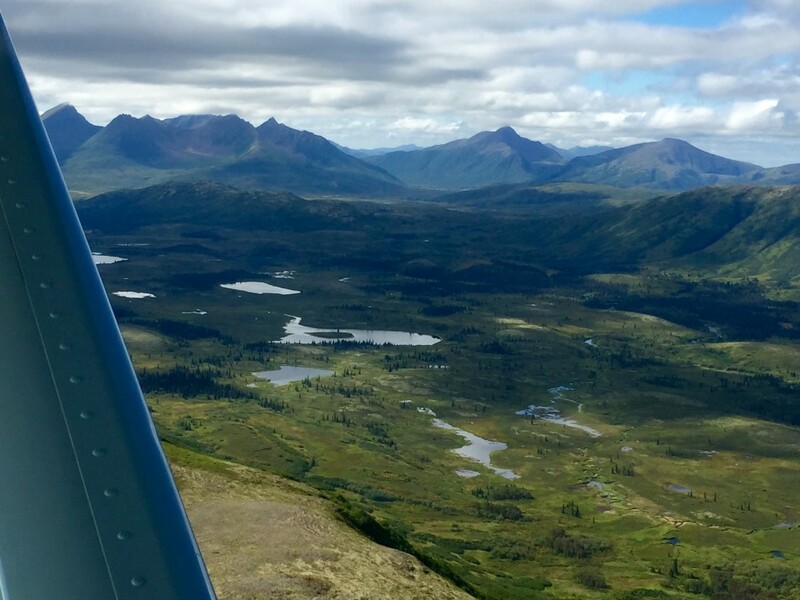 It was nice to sit around the family table and converse about some of the facets of Lake Aleknagik life that make Alaska extraordinary. There was great after dinner entertainment. The Romo’s pet Corn Snake was in need of his weekly feeding. Several Red-backed Voles made the snake’s meal and the speed and accuracy of his strikes were incredible. We said goodbye to the Romo’s and drove across the newly completed Wood River bridge hoping for clear skies in the morning. A thick blanket of fog blanketed Mission Bay of Aleknagik Lake. 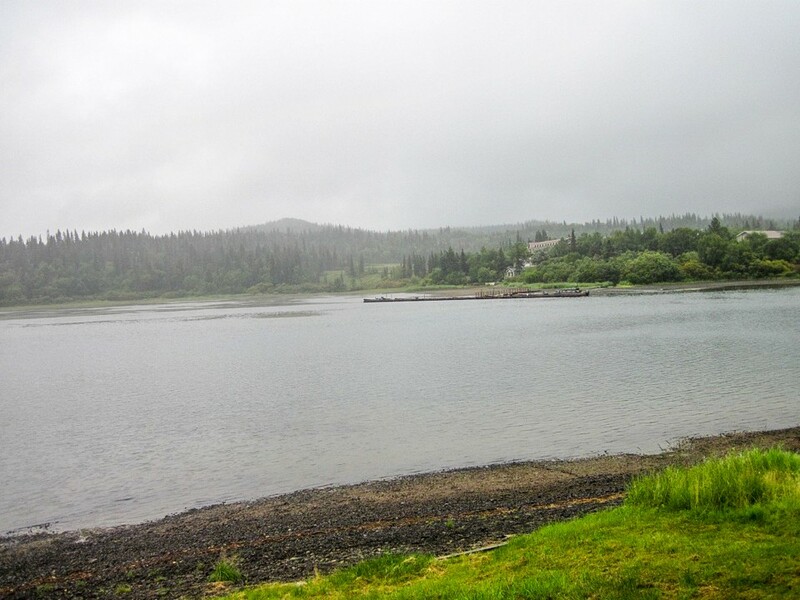 The floatplanes from neighboring Mission Lodge sat idle and we heard no buzz of aircraft engines passing overhead. We fixed breakfast and waited for news from our pilots. The morning forecast was for fog but we hoped that the weather would lift in the afternoon. mountain pass height leading into Kagati Lake is around 1,250’ which means one would like at least a 1,750’ ceiling to fly there. Another weather day dragged on and we did what we could to keep our minds occupied. It was a blessing that we were weathered in up at Aleknagik lake where we had recreational options like boating and local walks to combat cabin fever. 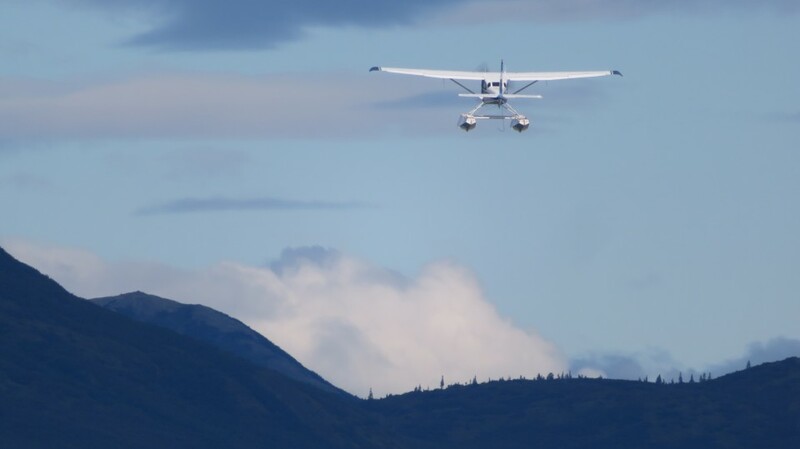 The tough part about waiting for the weather to change is that you cannot dedicate your time to doing a recreational activity that puts you far away or out of communication because at a minute’s notice, the weather could start to lift and we might get the call to fly. The weather was not hopeless and there were times we thought the weather might clear enough to get out. We realized by 4pm that we were not making it out in the marginal weather and we decided to pull the plug on flying for the day. Alex and Nora took out one of the Grant’s canoes to go for a paddle up the lake. Meanwhile, John, Bob, and Jason took out Ricks Jet Boat to explore the Wood River. Jason caught a Rainbow Trout just above the bridge on a streamer that was the first official fish of the family trip. 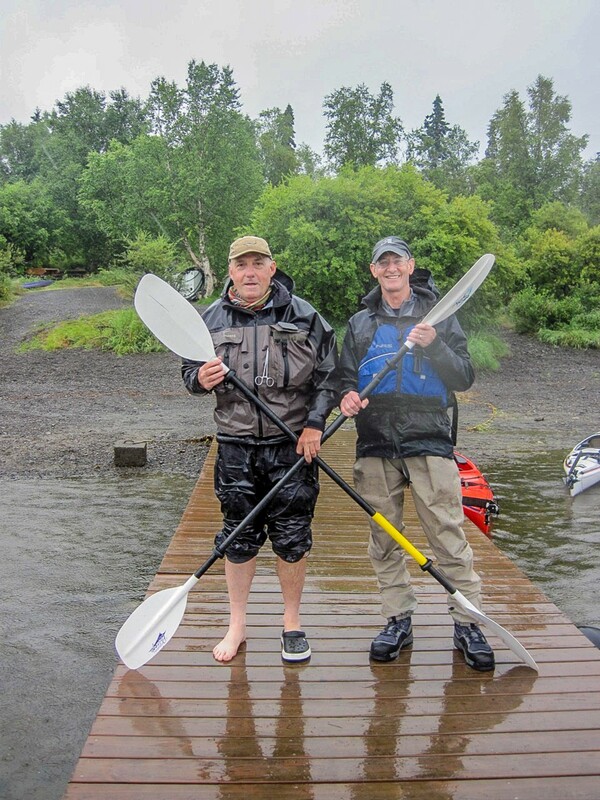 When Alex returned from his paddle with Nora he was still hungry for more and so he and Carl headed out kayaking in the misty afternoon. Later we enjoyed a pasta dinner and stayed optimistic for fly out day number three. At first light many of us rolled over in bed, peeked out the window -anticipating the early start we were hoping for only to find a blanket of fog even denser than yesterday. Around 9am, the Mission Lodge floatplanes took off up the lake chain only to return within 10 minutes unable to penetrate the fog. Sigh. Not a good sign! Fork of the Goodnews. He reviewed the options as the day dragged on. Some family members read books or magazines while others caught up on sleep, yet everyone stayed restless and eager to get on the river. After lunch we had an afternoon knot tying session both to pass the time as well as get our muscle memory activated for the knots we would be using on the water. In the middle of the session pilot Mike Hink came to the front door. He told us this day “was a no-go”. We got outside for late afternoon recreation. Aubrey, Nora and John took a jet boat up the lake to Moody’s to get enough fuel for two outboard powered boats. They headed out with a gang of anglers, all keen for adventure. Aubrey gave Nora, Carl and Bob a tour of the surrounding lake and explained the social dynamic of the residents living at lake Aleknagik. 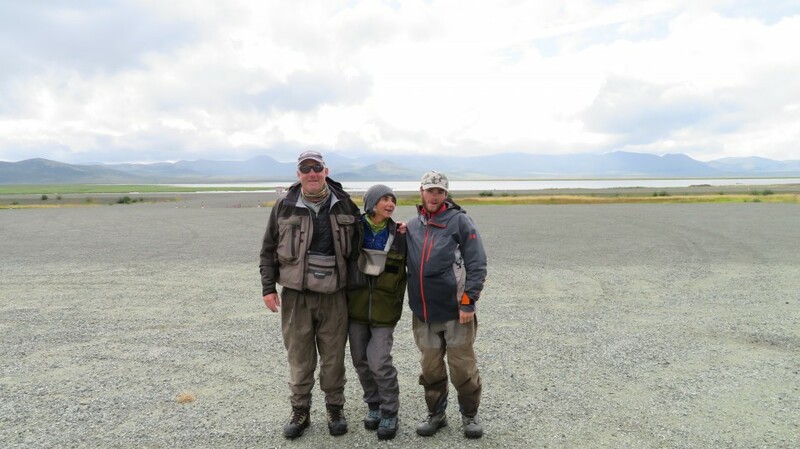 In John’s skiff, Jeff caught 7 Arctic Grayling and a Rainbow to make the outing interesting. In Aubrey’s boat, Bob caught a beautiful 19” Rainbow Trout and Carl who had been practicing his cast for a couple days was really starting to get the hang of it showing early signs he was going to be a threat to the fish if we ever got on the river. The Romo family graciously invited the guide families for another terrific Aleknagik dinner. The skies cleared in the late evening and a beautiful sunset unfolded across the landscape. We all enjoyed our dinner of Moose burgers and Salmon, and some ate out on the porch next to a warm fire. 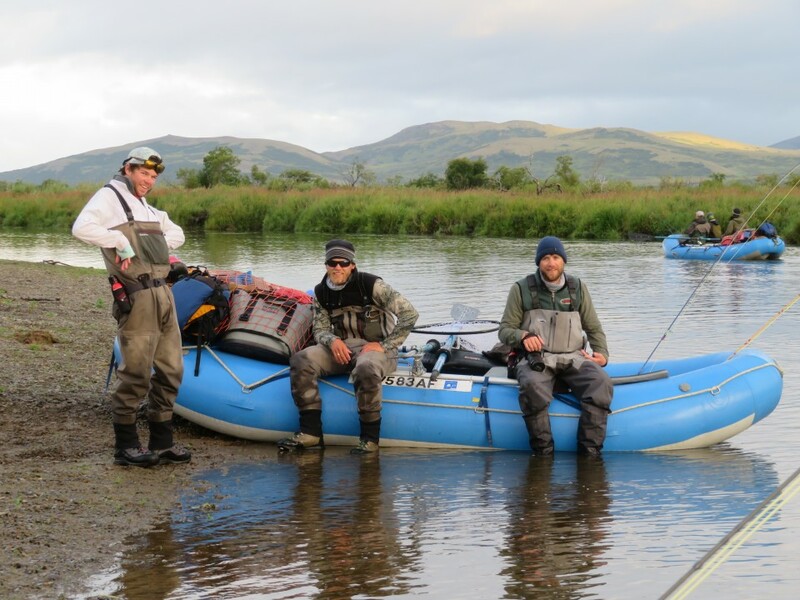 The food was delicious and the Jaacks brothers headed back out to fish into the late evening. With 3 days of “No Fly” weather that left us 5 days and 4 nights for our family trip. We all prayed that the weather gods would give us the opportunity to get out. By morning clear skies welcomed us, morale was back and we had a new plan. Weather permitting; we would fly to the Middle Fork of the Goodnews River. Indeed we flew outbound to Kukatlim Lake. On our final approach to the lake, a blond colored Brown Bear was making her way up the lakeshore. At last were all gathered at the lake. We inflated the rafts, ate a late lunch and exited the lake down river. 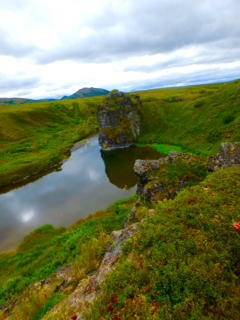 We were so happy to be afield enjoying the wild landscape that surrounded us. 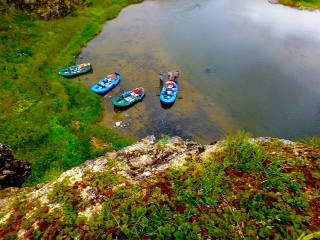 We rafted down narrow channels and over shallow gravel bars into large fish filled green pools. Pods of Sockeye Salmon scattered as the rafts passed overhead. A family of Merganser ducks swam directly underneath the rafts for an incredible view. In the upper river there are some rock outcroppings dramatically rising from the water’s edge. We hiked up one bluff to the top of the outcropping. The blueberry crop on top was a nice reward after the short hike. 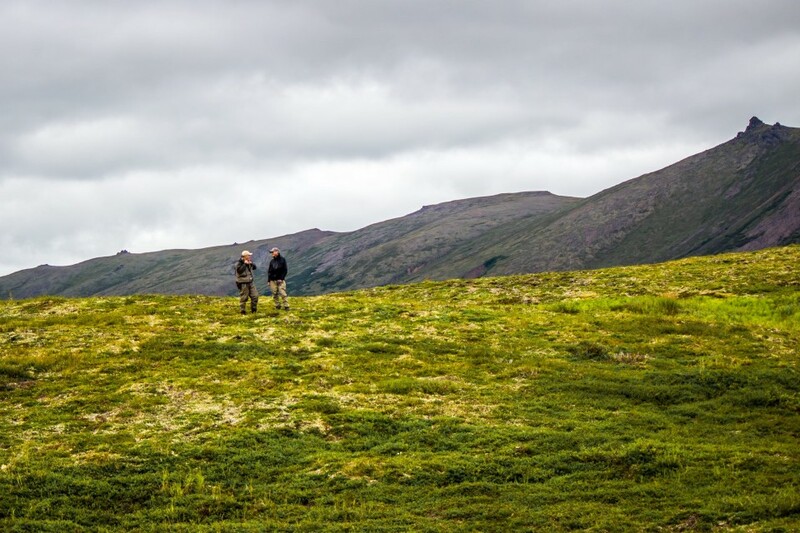 Back on the river a rustling in the bushes caught our attention and a big bull caribou bounded up the bluff. A couple bald eagles made an appearance so the wildlife viewings were great that first day. We found a nice gravel bar that would serve as our home for the night. Rods were rigged and the anglers got to the task of procuring a fish(s) for dinner. Bob found a productive Sea Run Dolly Varden Char “flat” -or sometimes we call it a “Char bed” and invited the others up to fish it. Our dinner came from the productive flat that Bob discovered. 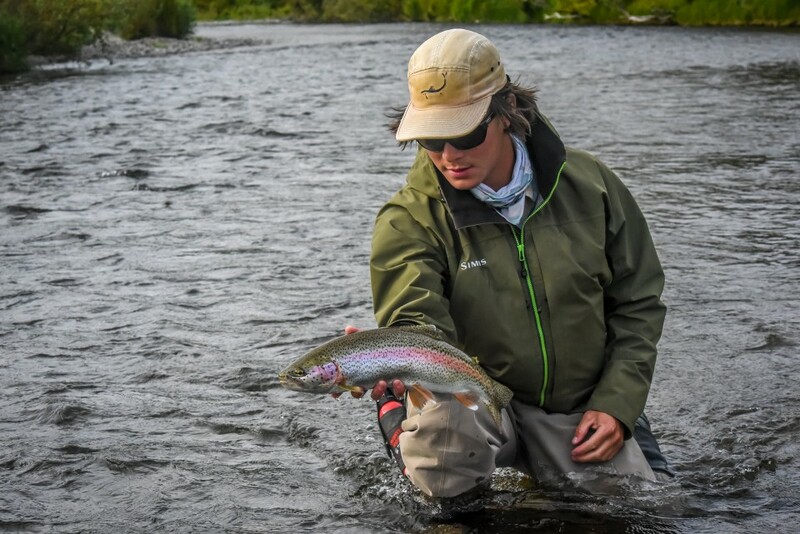 Its rare that we see head guide Brian take time out to fish but having his father along inspired him to break out a fly-rod and he took a nice Rainbow on the leach. A few other family members came tight to fish that evening. 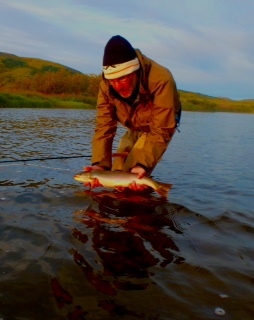 Bob released a really fine 20” Arctic Char and then retired for the night. We don’t catch many true Arctic Char downstream of the headwater lake so it was a pleasure to see diversity in the ecosystem. 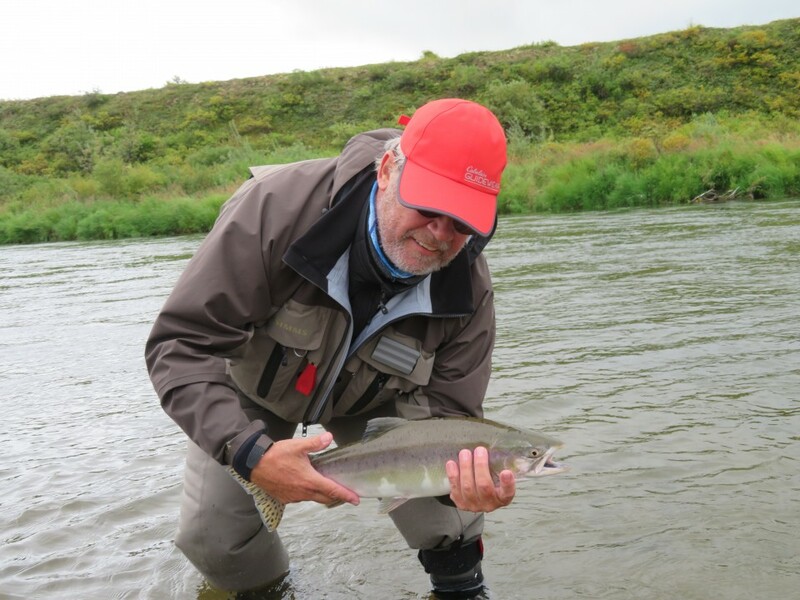 We kept three Dolly Varden Char for dinner and chef Pete’s meal was terrific. 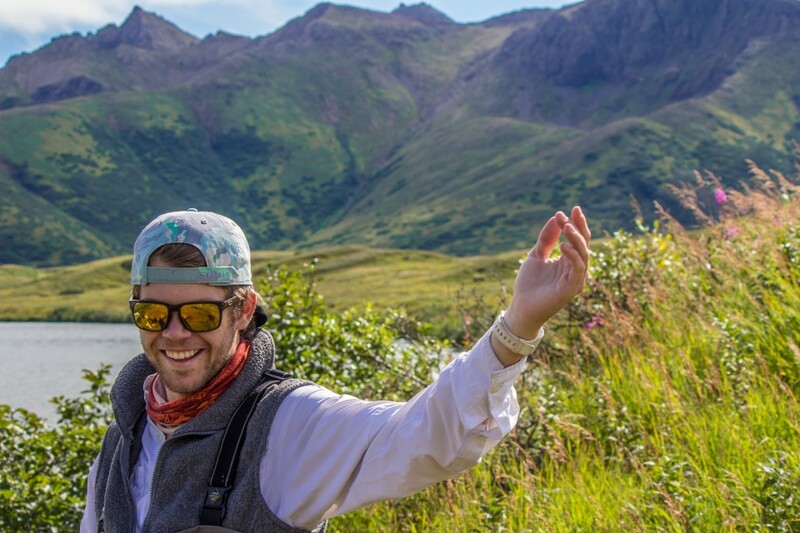 We were really happy to finally be together in the Alaskan bush. It was another weather surprise- awakening to a frost coated kitchen table. 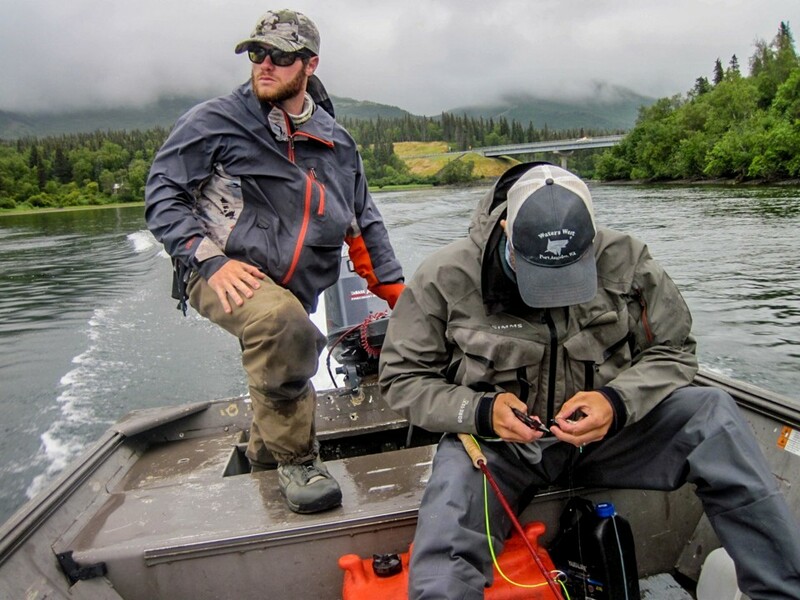 Some diehards, up before the first call for coffee were already fishing the Char flat. Bob, Carl and Alex found what they were looking for. They caught some spectacular char. 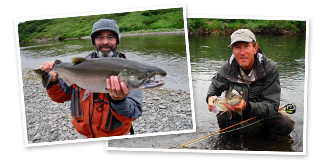 Carl caught a King Salmon on a bead and Bob caught a jack King. For someone with very limited experience casting a fly- Carl was “off to the races”. We broke camp at a modest pace once the cold morning air lifted but it seamed as if clouds accompanying a cold front were here to stay. The Char fishing was really good and both Ben and Bob released char over 23” during the days float. Alex released large char plus a nice King salmon while fishing with Pete. Nora resumed where she’d left off last year as “Top Angler” catching char at will. Carl sharpened his skills on the big Dollies. 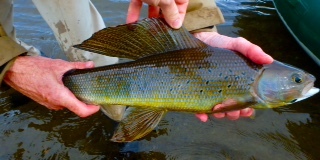 Ben and Bob both released some spectacular trophy Arctic Grayling. A steady rain set in and peppered us but couldn’t break our sprits. We were having so much fun enjoying the river with its impressive runs of fish and enjoying each other. We caught fish all the way down to our second camp. And then the fishing really turned on! Everyone caught their fill of fish at camp 2. Nora caught 2 Char that were over 2 feet and one behemoth over 27”. 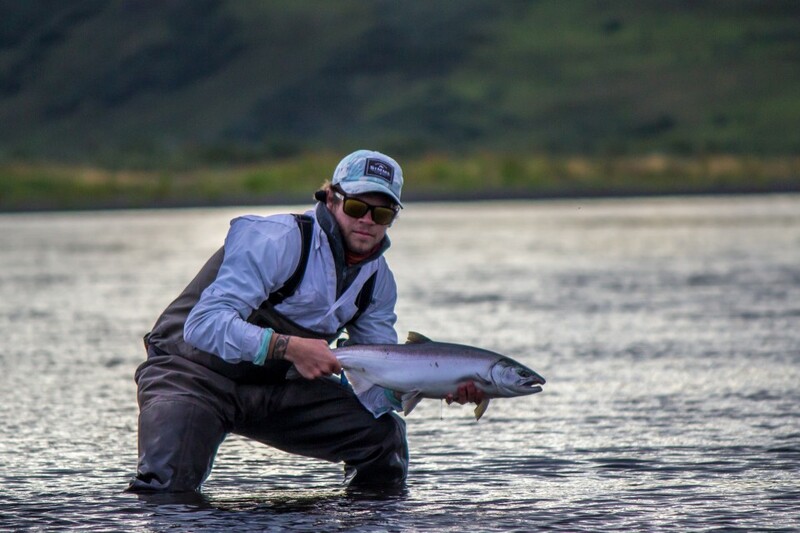 Ben Jaacks released a great Sockeye. We set up camp in steady rain starting with the sheltering kitchen “wing”. Once the wing was up we fully assembled the tents with their rain flys under the wing and then walked them out and staked them down tight. The family streamlined the camp set up process to deal with the weather elements we’d been given. Then some pre dinner spirits aka “brown water” mixed with hot coco! Chef Pedro “hooded up” and zipped his jacket tight then braved the elements cooking in a complete downpour. Thank You Pete! The rest of us enjoyed “the comforts” sitting out of the weather under the kitchen wing. After dinner some fished and some relaxed and the day came to an end in warm and welcome sleeping bags. During a float trip one ideally moves by raft at the pace of the river and with respect to the natural forces of the environment and weather. 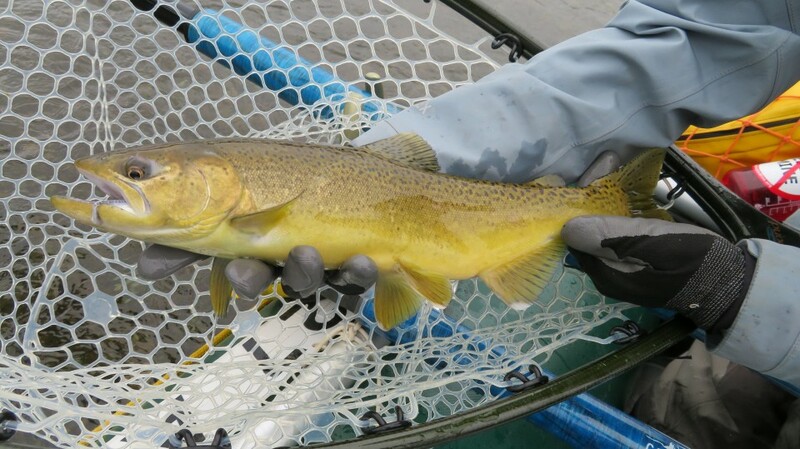 One of our objectives is to sequence each trip to effectively intercept migrating fish. 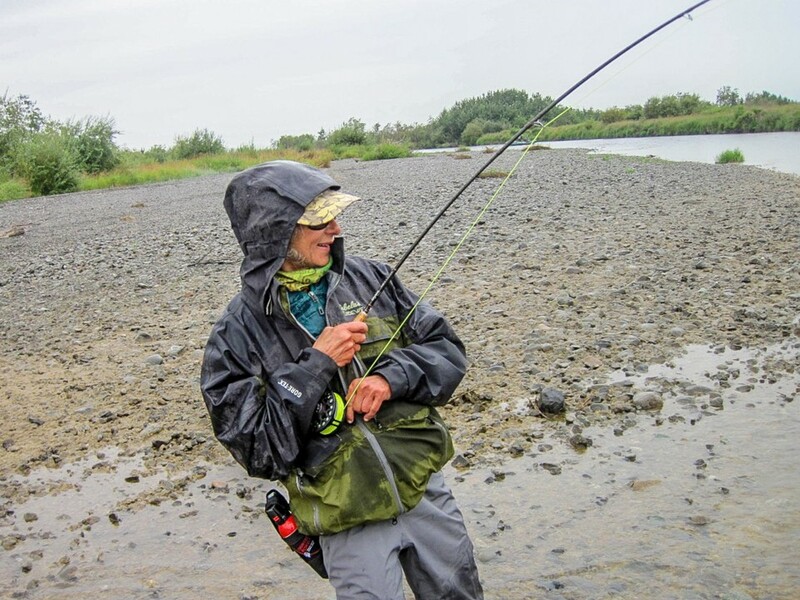 One doesn’t know on a really wild Alaskan river exactly what the pace of fish’s migration will be because there are simply no angling reports nor are there any water flow gauges. There is no local fly shop to stop and ask for information. Many of us love the challenges “of the unknown” that this presents. 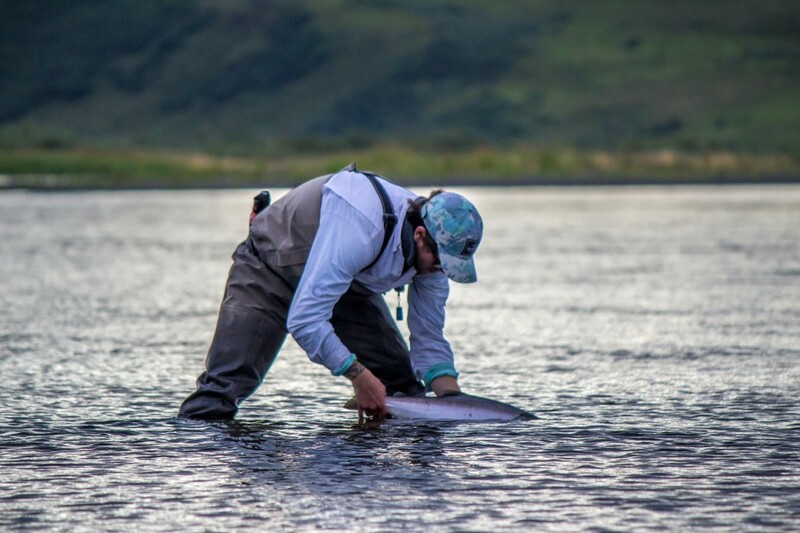 One’s daily challenge is to make observations of the fish run strength and timing and fish the river each day at a pace to take advantage of when and where it is most productive. 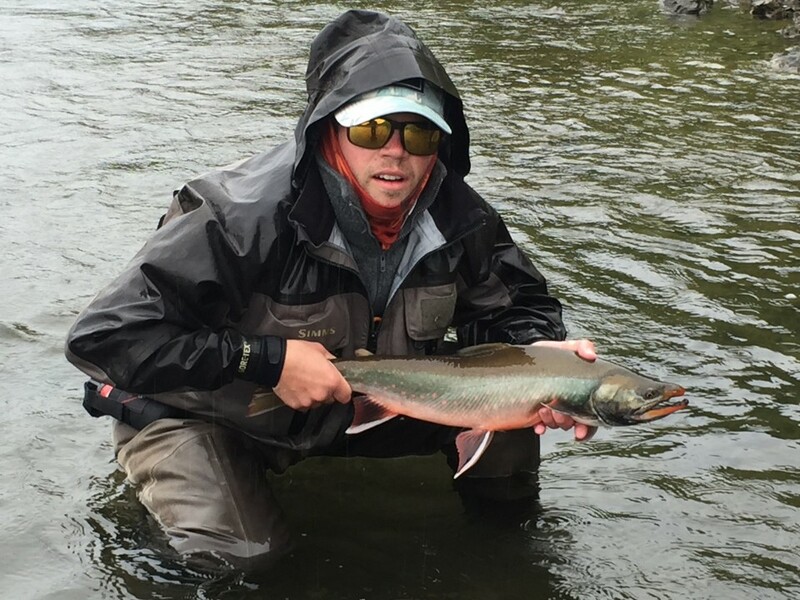 As we left camp 2 the migratory Dolly Varden Char fishing was very strong and the average size large. 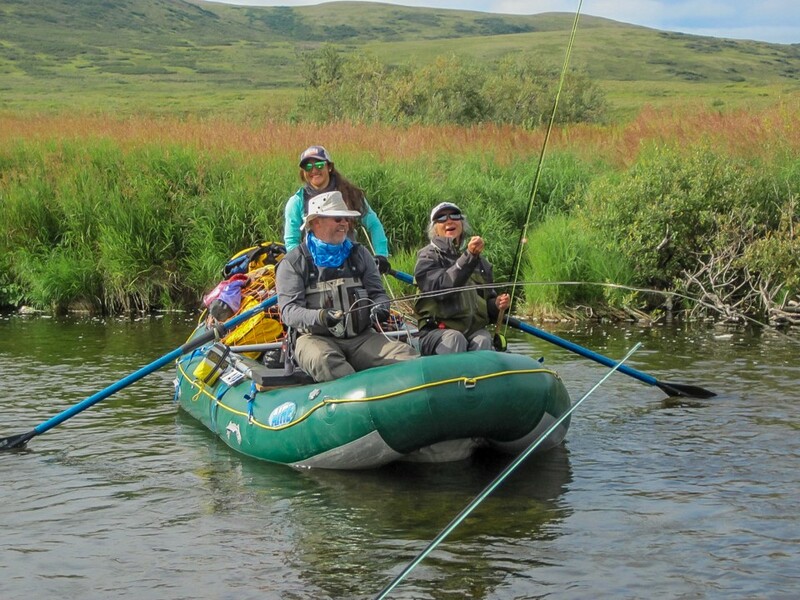 Good fishing continued and double hookups were the theme of morning three, however all good things must pass and we eventually left the peak of the Char population in our “rear view mirror”. 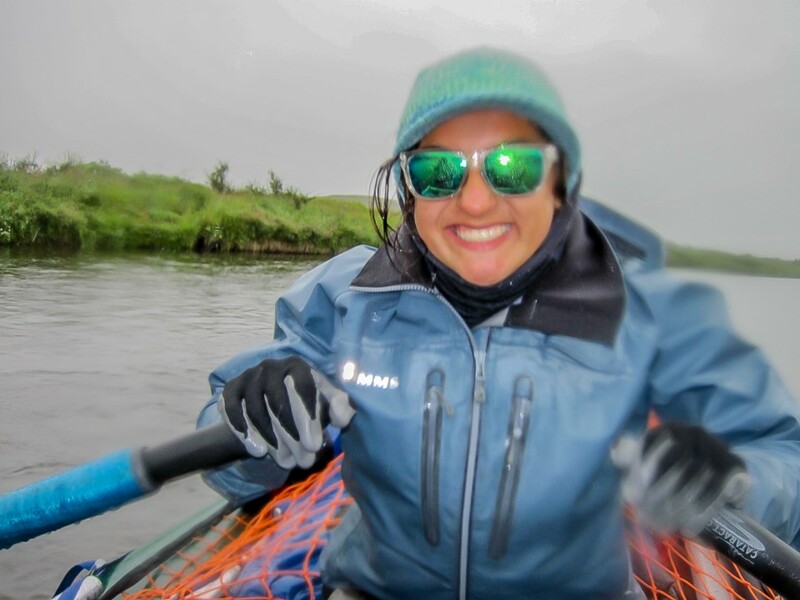 We saw our first signs of other people on the river at the Bristol Bay lodge tent camp about the time of afternoon when we needed to make some mileage. 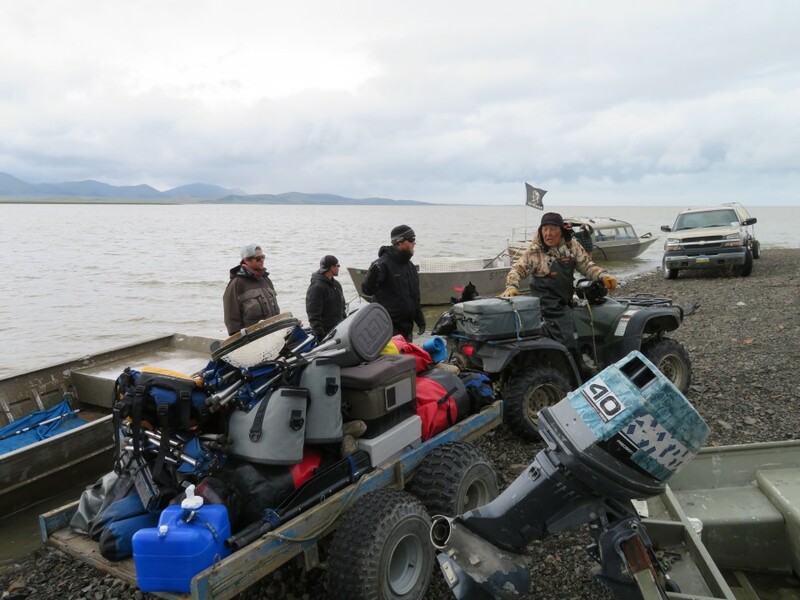 So mid day we “holstered” our rods and pushed ahead until we found a gravel bar with all the makings of home for the night. The weather was typically uncooperative but we had some intervals free of precipitation for us to get camp up and make hot drinks. 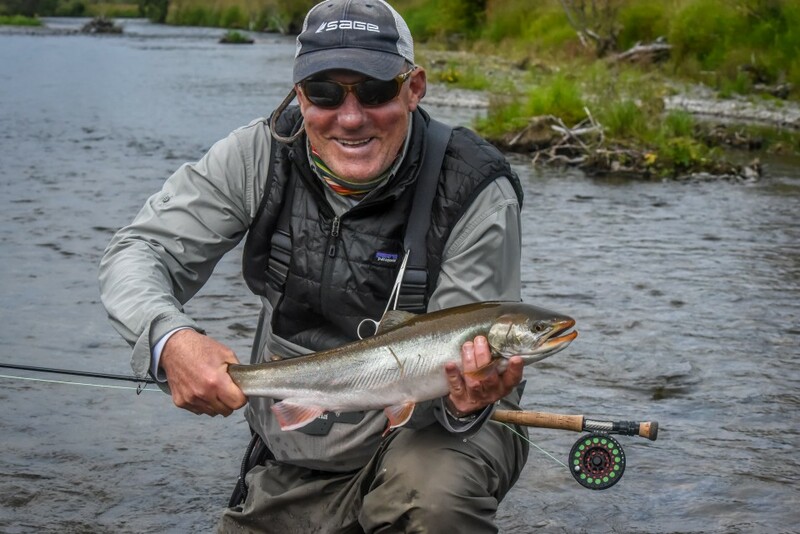 Some of us were enjoying our hot beverages when cousin Bob, who was out on the river swinging a large pink and orange streamer came tight to an impressive King Salmon. With perseverance and appreciation for the tackle busting strength of the King, the fish was eventually released unharmed. Bob retired his rod for the evening. Jason fishing a different pattern released a nice Rainbow out from the same reach. got a campfire built. Meanwhile on the beach Carl, working on his cast landed a dime bright Sockeye. 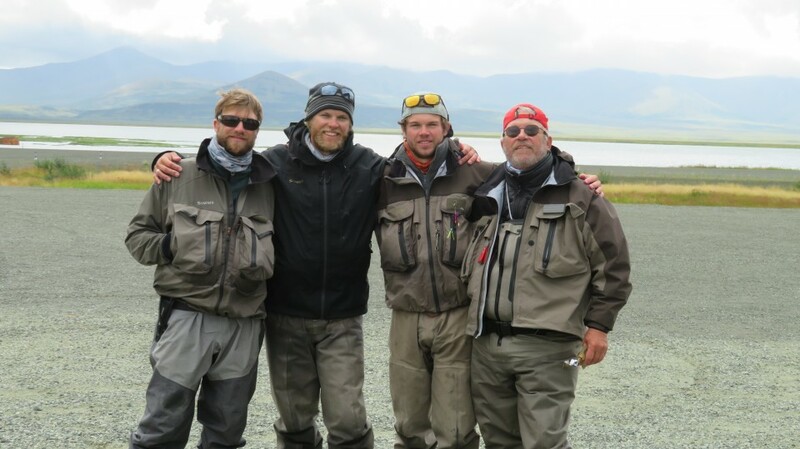 It was a special for us to see the pride in Brian’s eye as his father progressed as a fly fisherman. Once the boys got the fire going with enough heat to dry out the adjacent wood, it was roaring. Then everyone rotated through the firelight, storing the primal warmth in his or her bodies before turning in to sleep. We had one final big day ahead of us and plenty of miles to go. At this point we were in the lower river and people were reverentially asking the one word question: “Coho”? Of course “Top gun” Nora struck the first blood. She was fishing a deep run along a bluff with Brian and her line came tight to the first acrobatic Coho Salmon of the trip. It was still early in the day and we were enervated by her success! Now with Coho foremost in our minds we were exclusively casting bright streamers yet everyone was catching garden variety Pink Salmon, jack Kings and the occasional Sockeye. Nada Coho. Where were the Silvers? At lunch, Jason hooked a big Chum Salmon but in a fraction of a moment- at hand- the panicked the fish broke his fly rod. The winds picked up and the afternoon went on. We released Pink Salmon, Chums and Rainbows and then passed through the salmon counting Weir, finding it shut down early this year from (what we heard later was) lack of funding. The parts and pieces of the weir are stacked on the bank, ready for next season. In the headwinds cousin Bob cast into the gusts and was rewarded with a nice 20” Rainbow that charged his streamer. The winds got stronger still. Now gusting to 25-30 mph. 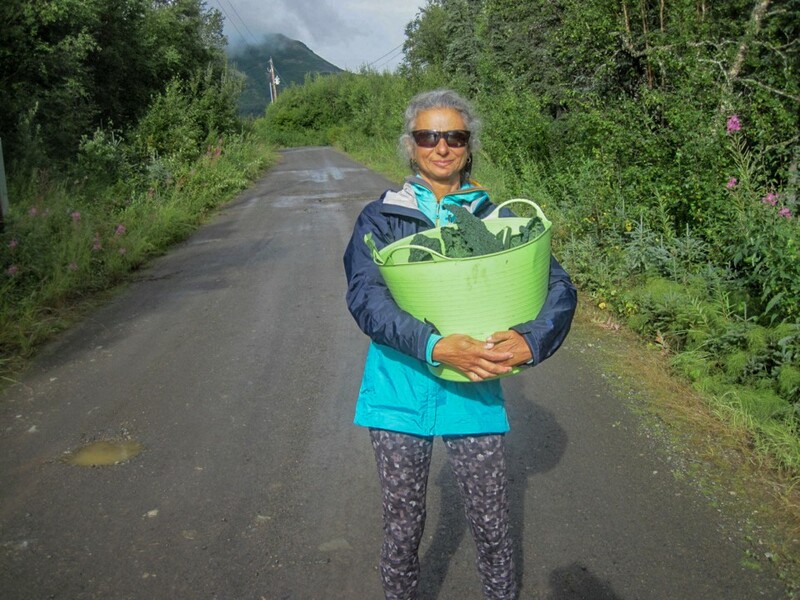 The oars-men and oars-women pushed beating through the wind. The three Jaacks brothers, all in a boat together, came up with a creative method of rowing to utilize the passenger manpower. While Pete pulled from the rowing seat, Jason and Ben turned around and pushed on one oar each. The method- and the boat were termed the “Jaacks-Wagon” and was an object of both functionality and humor. It was blowing sideways, a heavy crosswind, when we chose a sandbar camp just above the tidal estuary. With several nights practice we built the most bulletproof storm camp yet with 3 rafts as windbreak. 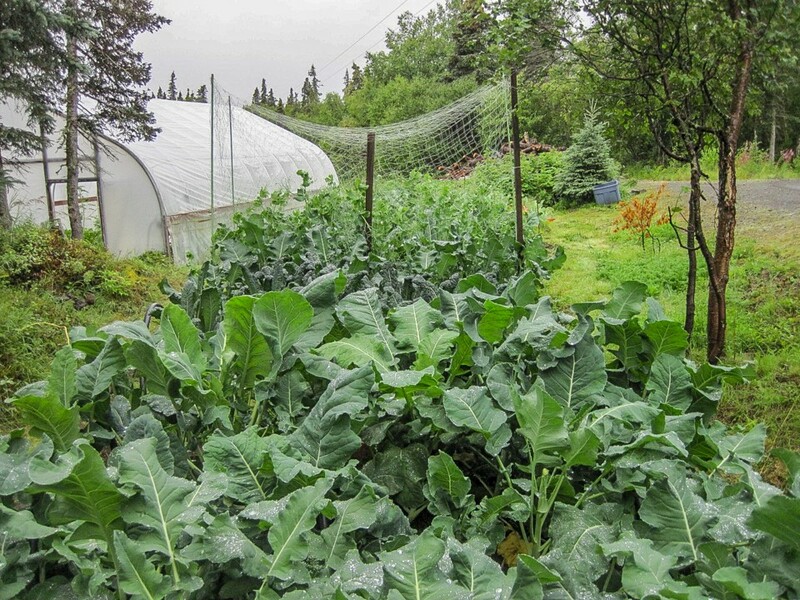 The, storm guy-outs on the tents strung tight, and major reinforcements on the kitchen wing solidified that as a windbreak. For dinner Pete served his signature Char Curry and we enjoyed a warm meal out of the elements. 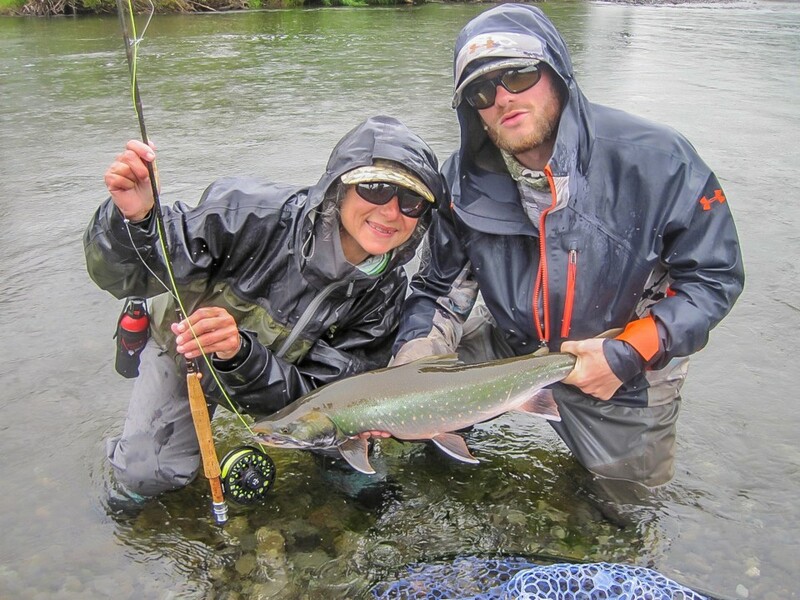 After dinner, the weather moderated, the gang returned their quest for Coho Salmon, and the sun made an appearance! Alex and Bob released a brace of Coho after putting their time in casting the heavy streamers and John managed one off the far bank. There was a bit of heckling of the Coho anglers from family members seated on the bank. A fine and challenging day came to a end. We knew we needed to be up early to head downriver and meet Bavilla Merritt for an early pick up. Of course cousin Bob arose before anyone else in the morning and caught Coho in the camp pool! However at the “Take out” island while we waited for our pick up Ben caught his first Coho! 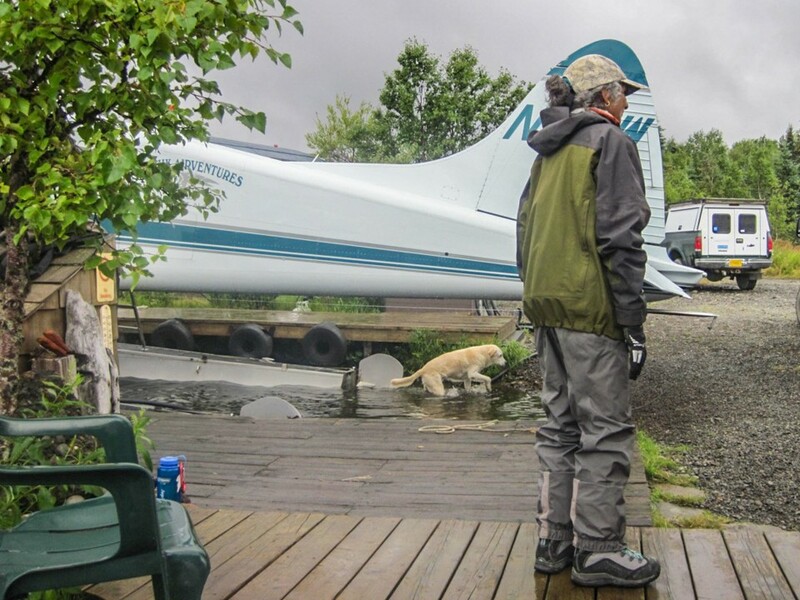 Bavilla and his son arrived in 2 outboard powered skiffs to transport us to the village of Goodnews Bay for our wheel plane pickup. Our boat ride through the estuary was one of reflection. We sat and recollected the events of the week that delivered us to this rich moment in time. 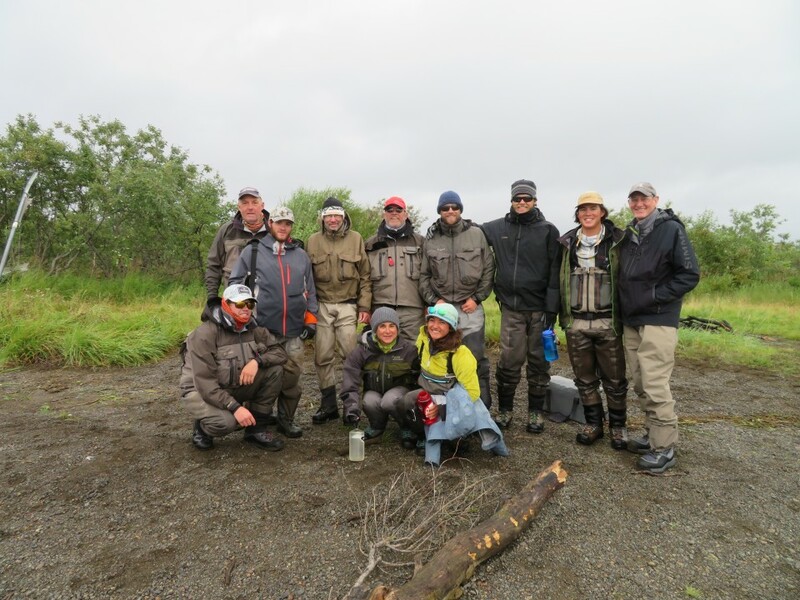 Although we had an unconventional start to the trip, it was a wonderful experience to have the guide family members out on that wild Alaskan river together.